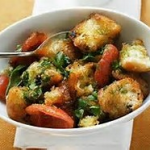 This Tuscan bread salad (Panzanella) is a traditional Tuscan summer salad and it's easy to make and is really good! Cut bread into rough, thick slices and place in a large bowl. Peel and halve tomatoes, then seed them into a sieve over a bowl to retain juice. Set tomato halves aside. Discard seeds. Season juice with garlic, black pepper, 1 cup olive oil and 2-3 tablespoons vinegar. Pour juice over bread and toss until it absorbs all the liquid. If more liquid is required to soak bread completely, add more olive oil. Blacken peppers over a grill or gas burner, then peel, seed, and cut lengthwise into eighths. Gently mix together tomato halves, peppers, drained capers, anchovies, olives and basil. Fill a large bowl with alternating layers of soaked bread and pepper mixture, beginning with bread and ending with pepper mixture. Allow to sit for 1 hour at room temperature. Serve moistened with additional extra-virgin olive oil.